I love free-standing collars. They are fun to make and so simple. Collars frame for your face, as we tend to focus on the face. You can change the look of a simple outfit completely by just adding a collar. You can even keep a few in your handbag if you need a quick change! 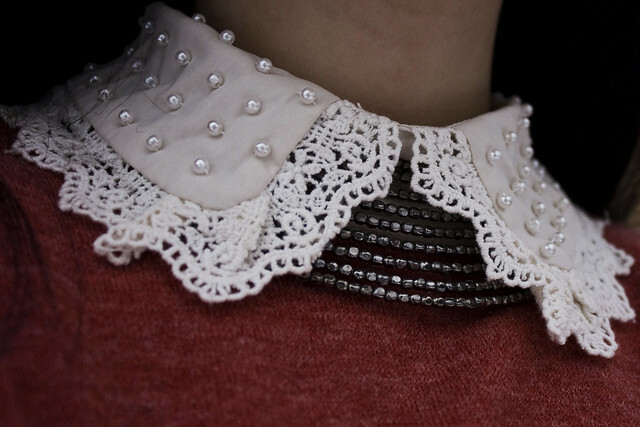 The embellished collar is particularly big now with the Barogue look. Every girl needs pearls! You may not want the little string of pearls but these pearl embellished collars you can make yourself will are just gorgeous. Just add pearls and lace to a plain collar to get this feminine look. The black and gold baroque look is just fabulous and that too can easily be done with a DIY collar and cuff added to your little black dress. 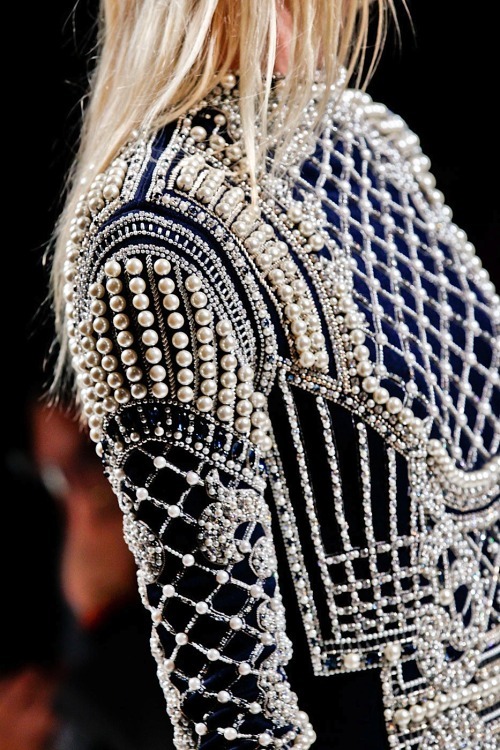 Either embroider a black collar and add pearls and sparklies or simply sew on decorative buttons! 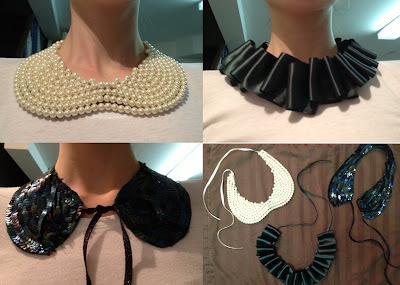 More great tutorial to make these collars. 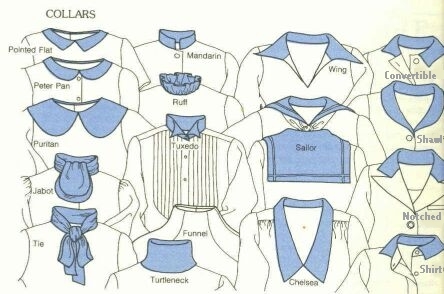 I especially love the ruffled ribbon collar. 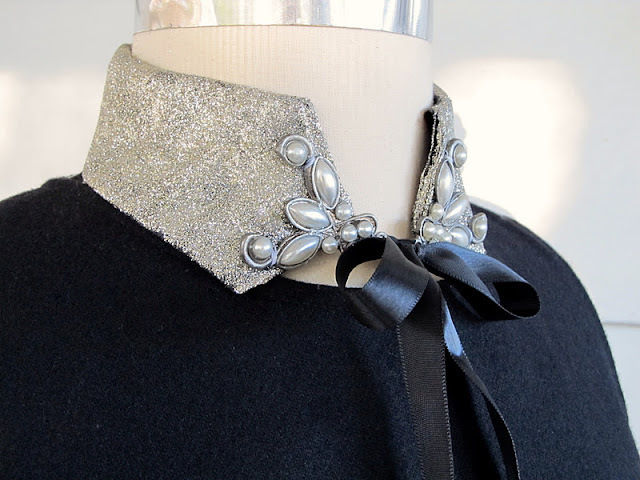 Then there is the silver and metallic look – the following pictures gives great tutorials for the collars – just click on the images for for the tutorials..
Here’s another idea for a black and gold Baroque collar in the Puritan style. 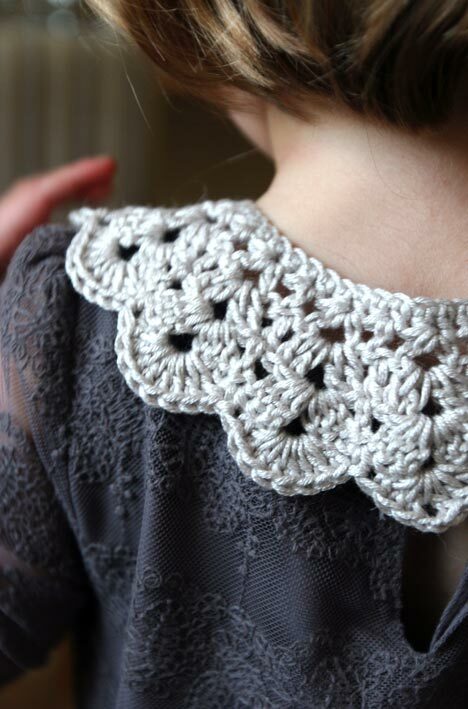 Just cut out a collar (x 2 plus facing) in the shape of the collar shown in the picture below to the size you want, and use thetutorial for the Peter Pan collar to make it up and embellish to your hearts delight. Tie with a ribbon or a decorative button with a button loop. 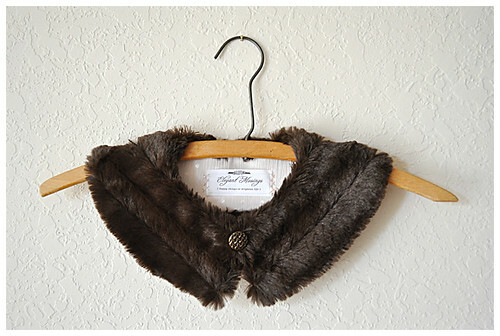 Ah, then there is the Faux Fur collar, lets not forget. If you haven’t found any collars to your liking here’s some more DIY collars from True Blue and Me. DIY Style Miu Miu Cat Collar by Audrey Kitching here. Love how she uses iron-on transfers (I use these all the time). 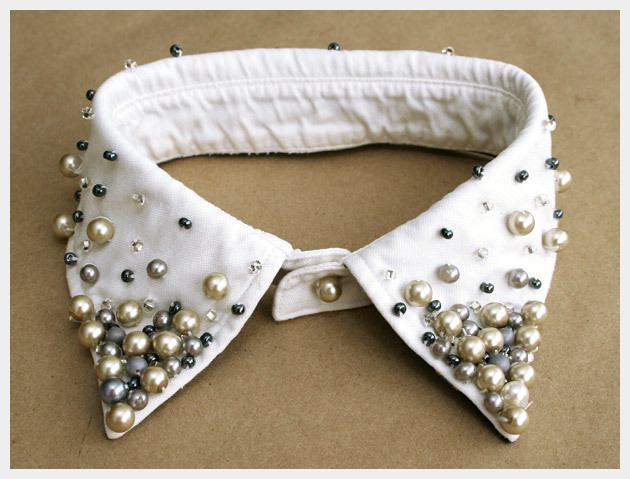 DIY Scallop Edge Detachable Pearl Collar by Megan Nielsen here. I was going to suggest glue and then read one comment saying how happy they were she sewed this the “proper” way. This collar reminds me of an antique one I own. 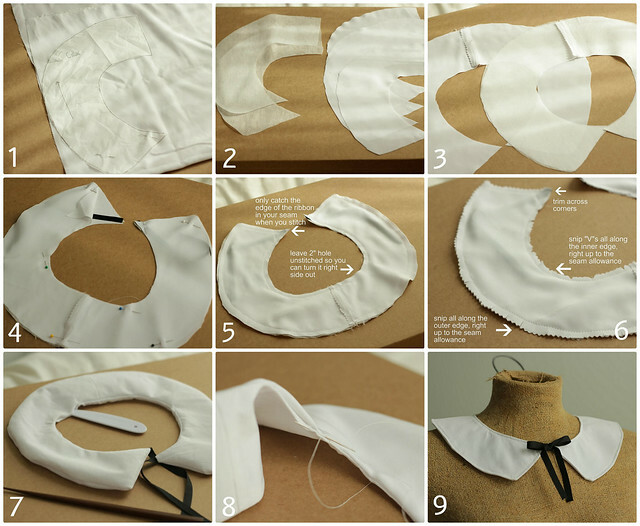 DIY Felt Scalloped Collar by The.Dot.Spot. here. I’ve included this because you can make any shape, any color with any number of perferations. DIY Inspiration from Marc Jacobs seen at acidule here. So easy to make. Zipper Collar Inspiration. Seen at acidule here. This is one of the few times I cannot find the source anywhere. 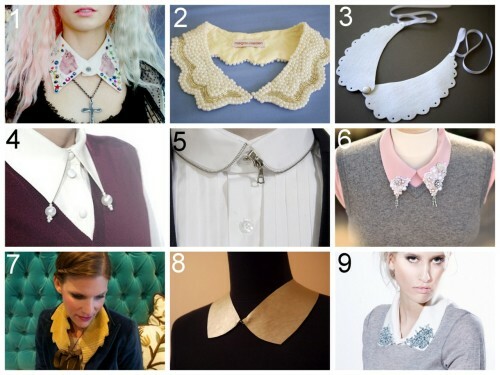 DIY Embellished Collar by …Love Maegan here. DIY Reversible Angel Wings’ Collar by Rachel Faucett at Craftzine here. Detailed pattern and versatile. DIY Louis Vuitton Gold Collar by just angelina here, using a tutorial by a Pair & a Spare here. Lastly here is a collar I made from an old shirt with a frayed collar, that would otherwise just have been thrown away. It can be worn up or down. 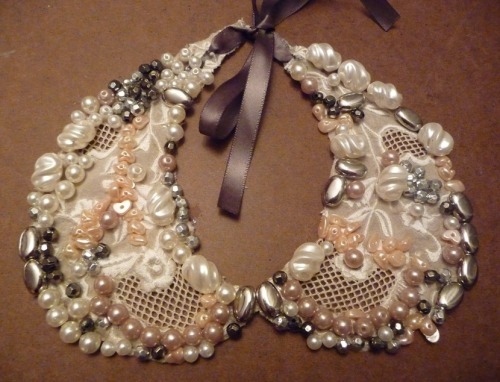 I will give the tutorial in my post – How to make a worn collar into a Baroque collar necklace. 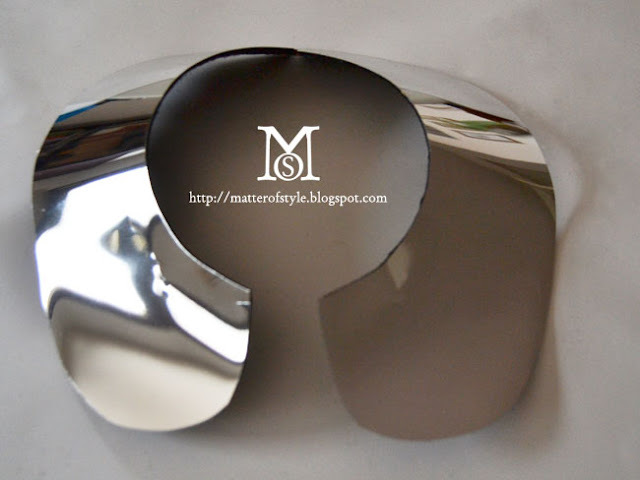 I will also do a few more posts on different types of collars because a just love collars.! Those are BEAUTIFUL! 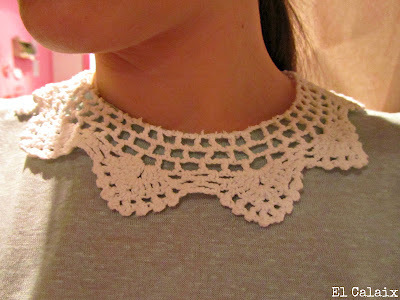 I have just learned how to embroider and this post has inspired me to create an embroidered collar!!!!! Embroidering is so relaxing and you always have something great to show for your relaxing. lol I enjoy embroidering while watching tv. Have fun, even with the simplest stitches you can make something beautiful.